I tested our home for radon when we moved in (early 1990s), and found that we had a borderline problem in the basement. Since we were planning to have children, and I planned to finish the basement, I decided to locate the source of radon. Using the store bought kits would make pinpointing the source very, very tedious, but I found instructions on how to build my own electronic real-time sensor in a January 1994 issue of Electronics Now (no longer published). 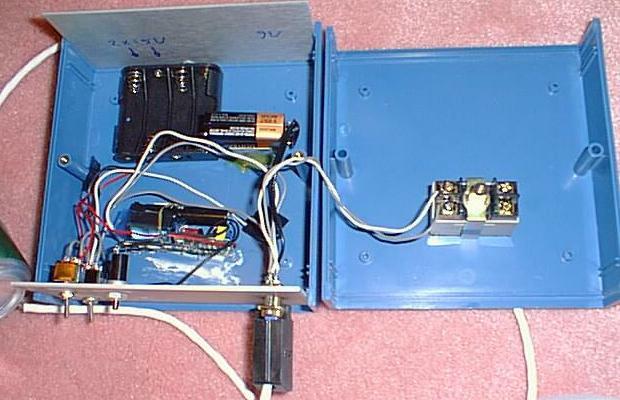 The article was by Paul Neher, where he describes a home-built radiation monitor. The interesting part is that the ionization chamber, used for detecting the particles directly, is made from two soda cans! A high voltage source is applied to an electrode, and any alpha particles entering it will cause a small discharge that is amplified by the circuit inside the soda can. 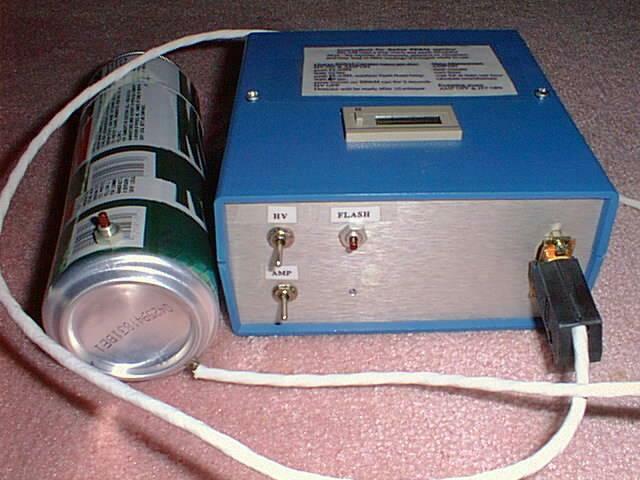 ionization chamber is made from two beverage cans. The 'hits' are counted on a solid state counter that is mounted on the top of the enclosure for easy viewing. My biggest problem was locating a clean source of high voltage (several hundred volts). I thought of using an electronic flash, and purchased a surplus unit for a few dollars. The flash is turned on with the 'HV' switch, and it is fired with the 'FLASH' pushbutton on the front panel. 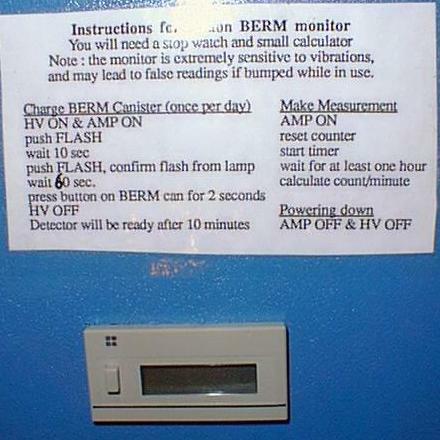 This readies the high voltage for use. A third toggle switch labeled 'AMP', turns on the 9V supply for the amplifier inside the beverage canister. complicated part is inside the ionization chamber (beverage can). The electronic counter counts the number of logic pulses from the amplifier in the soda can, and is powered by an ultra long life battery. I built the project in 1995, and the display is still working as of this writing (May 2001). The contents of the main box is very sparse, and contains mainly the batteries, flash unit, and the control switches. Connection to the can is via a 9-pin connector. The cable to the canister is shielded for low noise. The canister is very delicate and sensitive, and can not be bumped during operation. If it is, it will lead to false pulses being counted. digital counter showing the number of particles since reset. In the end I was successful in finding our source of radon. It was the sump pump well in the basement. Mitigation was simple, as I found a tubular fan onto which I hooked some ducting material to exhaust the air. The motor is controlled by a fan speed control, so I can keep the power consumption and noise down. A subsequent long term store-bought test a few months later showed that we were clean. I could have paid thousands for radon mitigation, but did it instead for less than a hundred, and learned about radiation sensors also! 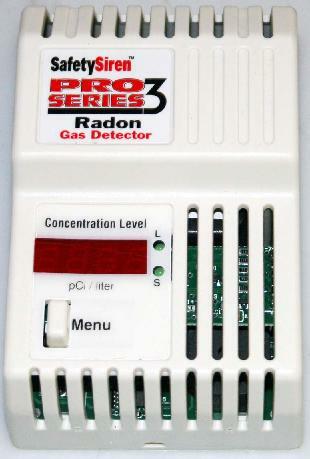 4/15/92 - Using a long duration (3 months) Radon Gas Detector from Radtrak, I obtain a reading of 11.7 pCi/l. The measurement was made in my basement. This is considered above average, and the accompanying fact sheet recommends to take measures to lower it below 4 pCi/l. 4/12/93 - The test is repeated in a slightly different location in my basement. The result is now 9.7 pCi/l. It appears that I have moved away from the main source, but it would take a long time with this method to pinpoint the location. 2/11/94 - The above sensor is built, and measurement starts. Near the sump pump readings are highest, about 20 counts per minute. Away from that location, less than 5 counts per minute. This data corroborates the second long term reading above. 2/26/94 - Fan is installed. Readings every where drop to less than 3 counts per minute. Fan is part number TM96BLR2959 for $19.95 from http://www.herbach.com (still available 5/01). 4/8/94 - Using another Radtrak sensor, I now get a reading of 0.5 pCi/l in the basement. Success. From readings taken during that period, and the test results, it appears that the (very rough) calibration of the sensor is 1 count per minute corresponds to 1pCi/l. 8/12/06 - I bought an commercial digital radon detector on ebay for $70 (includes shipping). 8/20/06 - I received an e-mail from Thomas Quick (tjquick@uakron.edu) about his efforts to hook up a computer interface to the above detector. 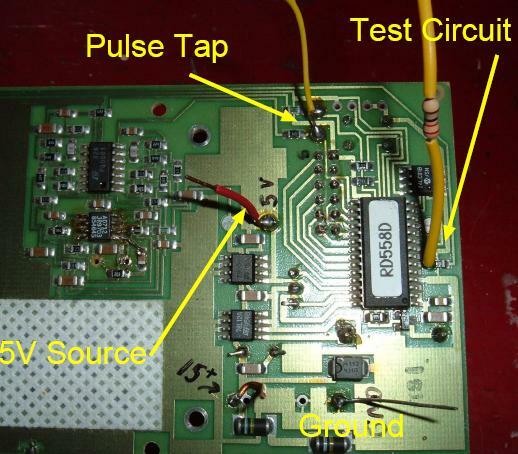 I found the source of the pulses from the op amp to the pic microprocessor. I taped at that point. Then I built a small pulse shaper (interface to computer) that is powered from the safety siren radon detector. In the picture I also show a test tap wire. Here the microprocessor sends a pulse to a small LED in the ionization chamber. The circuit expects to pick up a pulse from the LED light. This I believe is how the unit tests itself. If you would like any other diagrams, please let me know. I use the same interface for your detector system. Also can hook it up to a HOBO event logger. 10/12/06 - After two months of use, a clear trend is emerging. I started with a reading of 1.3 pCi/l in Short Term mode, and shut the above mentioned fan off. After a few days, the reading near the sump pump climbed to 5 pCi/l range. I then turned the fan back on, and the readings continued to climb slightly for another day before settling back down to the 1 pCi/l range. I repeated this a few times. This clearly showed the fan is still effective. 4/25/09 - I received a note from "snovotill", who sent me a copy of patent 4262203 (an alpha particle monitor), and also for patent 4859854 (pulsed ion chamber). He also wrote "The Safety Siren uses a solid state detector inside a biased chamber. It's not strictly speaking an ion chamber detector. This is why it has an LED inside the chamber for self-calibration". 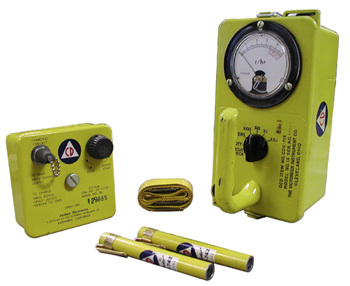 In the fall of 2001, I purchased a surplus Civil Defense Radiation Detector for $50. Since this has a sealed detection chamber, it cannot detect Alpha particles. Oak Ridge Research Labs site on the above commercial sensors (thanks to Ted Allen for the link). Another article on on-line via this great radon site from Tony DiMauro (thanks to Eur van Andel for the link). 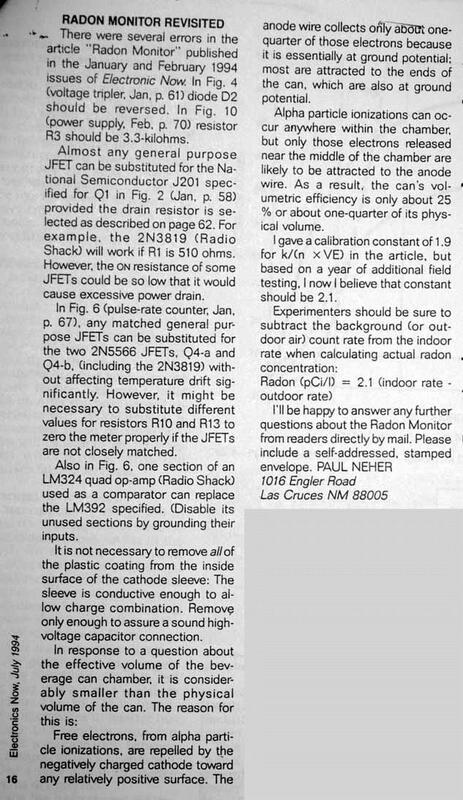 After many years, in October 2004, I was finally able to contact Paul Neher and he gave me permission to make available a copy of his article (from 1/94), and the subsequent errata (from 7/94). His e-mail address is paulneher.deletethishere@yahoo.com. The partial text for this article is online here. Thanks to John Beale (beale.at.best.com - 7/07). See also his site on Geiger counters. Chris Nafis set up a different way to read the Safety Siren unit (3/2012). PIN diode based Geiger counter kit from Jameco (7/8/2015).